Back to this cake, did it till midnight and slept for two hours and got up again to continue (as I need to rush back to see my dad....thank god he's better now). I have wrongly placed the numeric 1 on bottom tier cake instead of top tier and Sarah mom is kind to accept this. My apology for the mistake and thank you for you kindness. 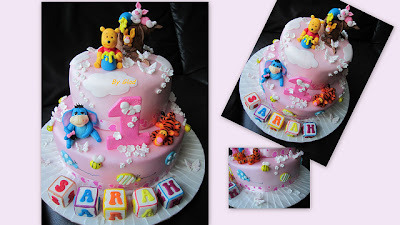 Am glad to hear from Sarah's mom when I came back that all are happy with the cake design and taste. Thank you. Really happy that you made such a lovely cake for my girl! Thank U! Hi Angela. Thanks for taking your time to post here... it's really a great rewards to me for making the cake.... Thank you. I am really thankful for your great understanding for the last minute change in collection venue. Thank you.